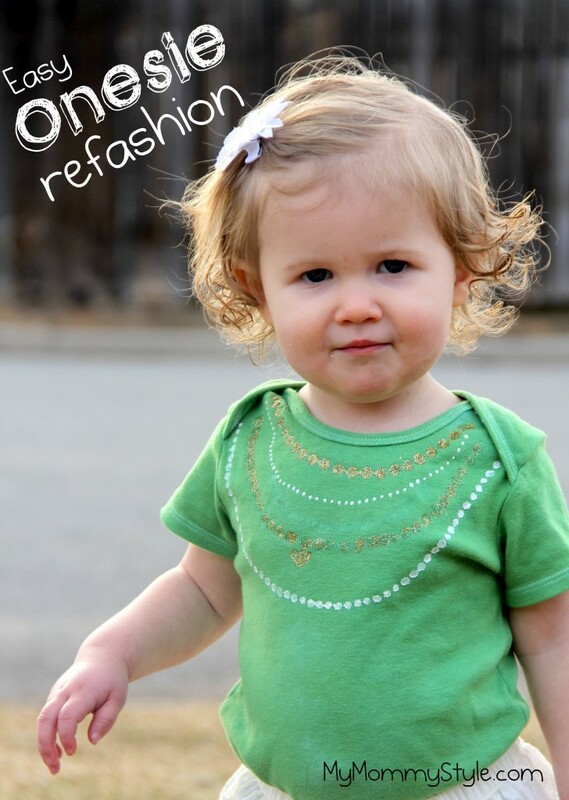 I wanted to get my daughter a cute green shirt to wear for St. Patrick’s Day this year, but it is pretty hard to find a green shirt for a baby girl, especially if you live in a small town like I do. I did find some actual St. Patrick’s Day dresses, but they cost a lot of money for something she would wear once, so I decided to make my own. The best part is I made her a shirt out of an old stained white onesie that I was going to throw away anyway. The total cost of the project was about $4. First I dyed the ugly stained onesie green. The green dye hid the food stains on the collar and the poop stain (yeah, gross) on the back beautifully. Then I used gold and white fabric paint to paint on some necklaces. Ta-da! Easy new shirt out of one I was going to throw away! The only thing I wish I did differently was put the shirt on her first to decide where to paint the necklaces. When I was painting they looked like they were in the right spot, but when I put it on her It kind of looks like she is wearing a necklace on her shoulders. But I still think it is cute. Don’t throw away those white onesies that aren’t so white any more! Use a little dye and make a whole new look!